Episode #15 – David, Mark, and Nathan celebrate as the Blackhawks fall to last place in the Central Division, review games against the Golden (yellow) Knights, Coyotes, and Kings, remind you why they don’t do pick’em anymore, and update you on Central Division rookies thus far. Finally, in the Preds Week Ahead they prepare you for upcoming games pre bye-week versus the Oilers, then afterwards versus the Golden (yellow) Knights, and Coyotes. Déjà vu!? Episode #13 – David, Nathan, and Mark are each in separate states recording their Festivus episode. 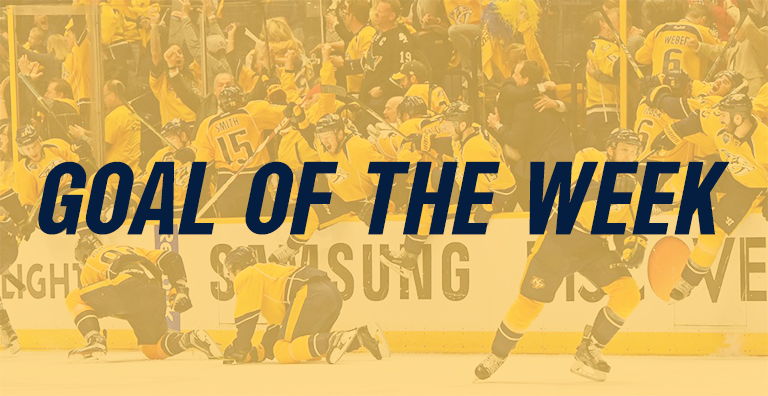 Mark updates you on Festivus miracles (NHL Central division update), then the airing of grievances (Predators Week in Review) as the Predators only manage to steal one point in a shootout loss to the Stars. Mark and David then do a deep-dive into the corsi, heat maps, and a penalty breakdown from the past three games to determine if this is a fluke or a larger issue. Finally, we bring you the Feats of Strength (Predators Week Ahead) with games versus the Blues and Wild. Happy Festivus for the rest of us! Episode #12 – David and Nathan are pumped to bring you a great week of Predators hockey! Nathan recaps the Central Division standings with the Preds in first place, review games from the Western Canada trip versus the Canucks, Oilers, and Flames, then dive into the numbers comparing the 16-17 team to this 17-18 team through 32 games. Finally, we bring you an upcoming week of games versus the Jets, Hurricane, and Stars. Episode #11 – Mark and Nathan recap the Ford Ice Your Mom versus Mid-Ice Crisis game while considering a new segment; the Ford D-League standings. They quickly move on to update you on real hockey, with the Central Division standings, recap games against the Bruins, Stars, and first ever game against the Golden Knights. David and Nathan consider if James Neal would consider coming back to the Predators, then preview upcoming games versus the Canucks , Oilers, and Flames. Episode #10 – David and Nathan find out that Mark has a better agent than they do, so don’t expect Preds Week Ahead music anytime soon. Seriously though, we update you on Central Division standings, recap games against the Blackhawks, Canucks, and chippy game against the Ducks, then discuss the Preds third period– is it really as bad as it seems? Finally, there’s a preview of upcoming games versus the Bruins, Stars, and the expansion Golden Knights in the music-less Predators Week Ahead. Episode #9 – Mark is out searching for Smith-like confidence leaving David and Nathan to update you on the Central Division standings, recap games against the Canadiens, Blues, and Hurricanes. They then dive into Craig Smith and Mattias Ekholm’s impact on the Predators. Finally, we preview you for upcoming games versus the Blackhawks, Canucks, and Ducks in the Predators Week Ahead. Episode #8 – Mark makes it two episodes in a row and Nathan protests all the penalties! The trifecta update you on the NHL Central standings, recap games against the Capitals, Wild, and Avalanche. We discuss the Predators league-leading penalty minutes and dive into some causes and outcomes. Finally, we preview you for upcoming games versus the Jets, Canadiens, Blues, and Hurricanes in the Predators Week Ahead. Episode #6 – Nathan’s running solo with your Central Division Updates, Recaps the West Coast trip against the Sharks, Ducks, and Kings games. Then an overview of the huge three-way-trade between Ottawa, Colorado, and the Predators which provides Nashville much needed depth at center. Finally, a look at the week ahead and the Predators play the Blue Jackets, then the Penguins. Episode #4 – Mark is off doing his best Juuse Saros impression leaving David and Nathan to update you on the NHL Central, Recap games against the Flames, Hawks, and Islanders, discuss the backup goalie troubles, and prepare you for the Preds West Coast road trip against the Sharks, Ducks, and Kings.